Birger Engineering, Inc. was founded in 1999 by Erik Widding. Widding is a 1996 graduate of the School of Engineering and Applied Science at the University of Pennsylvania. Widding is a life long amateur photographer, with academic interests in compression and machine vision. Prior to founding Birger, Widding was employed by Polaroid as an ASIC designer in the Consumer Digital Camera group, and as a Test Equipment Design Engineer at IBM Essex Junction. Birger Engineering is located near the corner of Chauncy and Summer Streets (marked X, on the aerial view). Please click on the aerial picture above to get a more detailed view of the neighborhood. Visits to Birger are by appointment only. All major MBTA subway lines a served by stations within a few blocks walking distance from Birger Engineering. The nearest T stations: (A) Downtown Crossing Station - Orange Line, Red Line & Silver Line (South End); (B) Park Street Station - Green Line; and (C) South Station - Silver Line (Airport), Amtrak & Commuter Trains. If traveling through Logan airport, the easiest way to get to downtown Boston is to take the Silver Line Bus from your airline terminal to South Station. Though a longer walk, this will be much faster than the taking the Massport shuttle to Airport Station, to then take the Blue Line to State, and then take the Orange Line to Downtown Crossing. There are a number of parking garages located nearby. The easiest access is the garage underneath the Hyatt Regency Hotel across the street from Birger. The entrance to the garage is on Chauncy Street at Bedford Street. 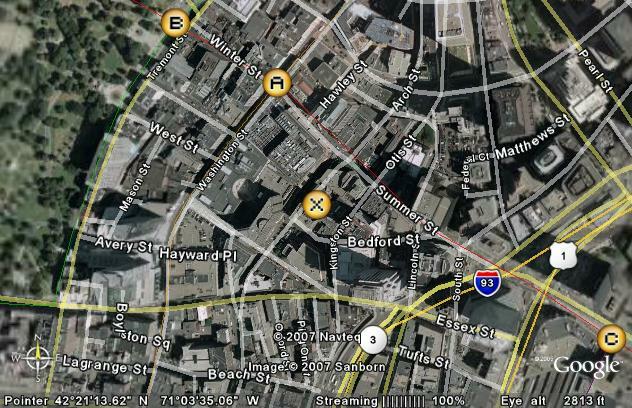 If coming from outside Boston, your GPS will generally route you from South Station on Bedford Street, and you can continue through the intersection into the garage. © 2018 Birger Engineering, Inc.